Check out this mysterious pinball table. Is it a machine from the ancient Egyptians or technology from aliens? Heck if we know, but you'll have to figure out how to configure it for the highest score. The Apparatus has four modules, each of which you can make flip between sides A and B. Maneuver the modules to find the configuration you like best, and to discover the Ultimate Configuration for maximum scoring. Autosave for balls lost before reaching 25k or 15 seconds. Points per bumper in module 2A: 2450. Points per bumper in module 4B: it’s complicated. Base points per bumper: 1500. Hit any target anywhere on the table to increase the point value of one of the bumpers to the next scoring level. 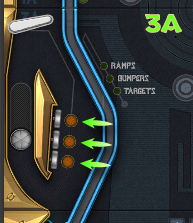 Five target hits are required to advance all bumpers to each successive level. Point levels after the basic level: 2000, 2500, 3000, 4000, 5000. Bumper points reset to the base level on any module flip. Hit the turbo charged target in module 4A: score 30k. Light all targets in a set: score 30k. 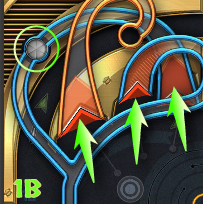 Hit all 3 targets in the set in modules 3A or 3B and reset the left kickback. Score 15k per ramp on the left side of the table. Score 12k per ramp on the right side of the table. Ride the ramps 10x to trigger a multiball and score 100k. 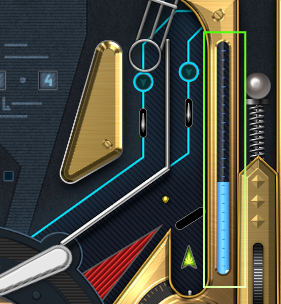 The tank of blue liquid shows progress towards triggering. The number of ramps required to trigger increases by 5. Max 50. The point award increases by 50k. No max. Send the ball around the top: score 15k. Clockwise and counterclockwise (when configuration permits) score equally. Go around the top 2x: reset the right kickback. Go around the top 10x with more than 1 ball in play: score 1m. Limit once per multiball. 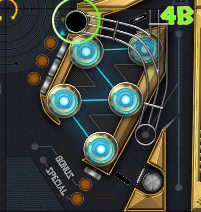 If 4A is showing, from the plunger send the ball to the flipper in module 3 and hit around the top. 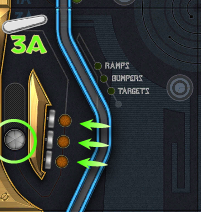 If 4B is showing, from the plunger send the ball to the flipper in module 3 and shoot into the 4B ramp capture hole. Will save the ball from draining when active. Deactivates each time a ball is saved. 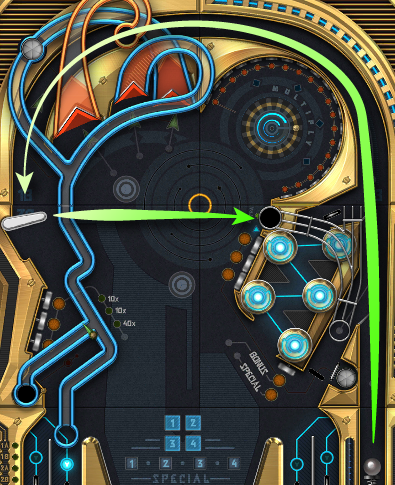 Re-activate kickback: hit all 3 targets in the set in module 3A or 3B. Re-activate kickback: go around the top 2x. o Light all 4 to score 66k. Each side (A and B) of each module has a capture hole. All capture holes start the game closed. Open a capture hole and capture the ball in a module to flip it to the alternate side (A to B or B to A) and reconfigure the Apparatus. 1A: Hit the targets 6x (any combo). 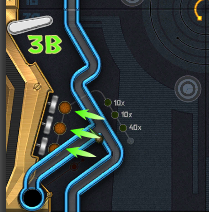 1B: Roll through any of the ramps that start in 1B 6x. 2A: Hit the bumpers 20x. 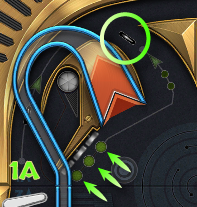 2B – the magnetic capture: strike the targets to increase the wheel speed to at least 300 degrees per second (a little slower than 1 turn per second). 3A: Hit the targets 6x (any combo). 3B: Hit the targets 6x (any combo). 4A: Strike the two drop gates blocking the way. 4B: Hit the targets 4x (any combo). The hole will reset after a capture. 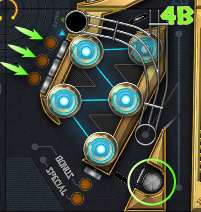 The capture holes are temporarily closed and modules cannot be flipped during multiballs and skill tests. Progress toward enabling the capture holes is unaffected and continues however. The capture holes open to their current progress status once the multiball and/or skill test are complete. Flip any module: score 150k end-of-ball bonus. Light the entire target set in module 4A to increase your end-of-ball bonus multiplier. Can increase up to 5x. Resets to 1x on lost ball. Flip the special module: score 300k immediately. 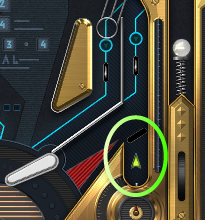 The current special module is indicated between the flippers. The special module changes on each lost ball. Configure the table to all B sides: score 1m. Only resets after all the Skill Tests are completed. 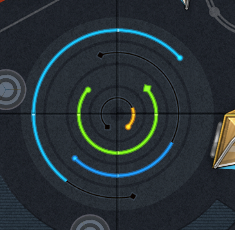 Complete the target set + activate the rollover at the center 3x to trigger. Resets when multiballs are lost. 4x on the 1A ramps causes a Power Overload. No special powers. Just enjoy the ramps. Light the ADD rollovers: score 50k. Points increase +5k per trigger. Max 200k. Resets on flip of module 2. Hit mini-targets to power up the wheel. Speed decreases over time so keep hitting the targets. Each spin of the wheel scores 1k. Light all mini-target lights to orange: score 50k and increase wheel score multiplier. Light all 3A targets to trigger. System Checks continue even if you change configurations. And you may need to change if you trigger a bumper System Check and your configuration doesn’t have any! Score 150k for each System Check you complete. Complete all 3 System Checks to raise the award by 50k on subsequent System Checks completed. Repeat to increase by 50k again. No max. Light all 3A targets to reset the left kickback. Light all 3B targets to trigger. 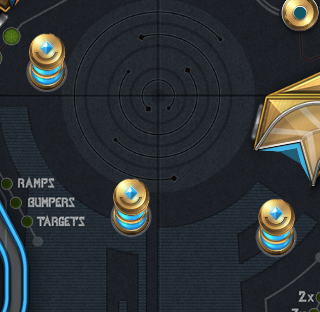 For 12 seconds, a multiplier applies to any ramp points earned. 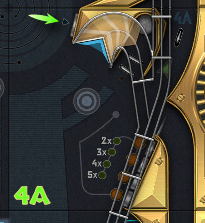 The multiplier decreases during the 12 seconds down to 1x. First Ramp Bonus starts at 10x. Second also starts at 10x. Third starts at 40x. Rinse and repeat. Light all 3B targets to reset the left kickback. 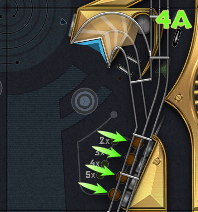 Light all 4A targets to increase the end-of-ball bonus multiplier. Can increase up to 5x. Resets to 1x on lost ball. 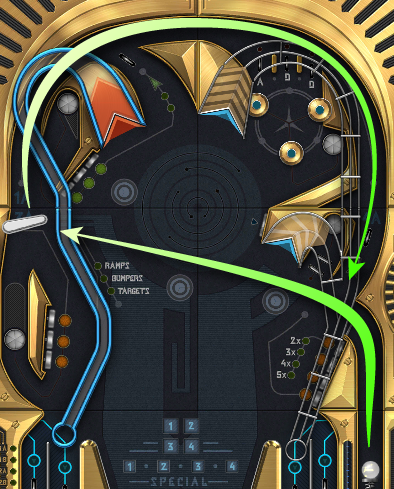 Hit the turbo charged single target next to the ramp: score 30k. Activates at random for 15s (minimum delay of 30s and 350k points). Hit the bonus target when activated: score 100k. Earn the 100k bonus 6 times and the next activation is worth 1m. The Special light will be lit. Bring all power on line to trigger the Ultimate configuration. Center circle lights display progress towards power being on line. Power #1 – pale blue light: 100 bumpers. Power #2 – dark blue light: 100 targets. Power #3 – green light: 15 ramps. Power #4 – orange light: 4 module flips. Power source requirements increase 25% after each Ultimate triggered. Base points per bumper: 3k. Next Power Up award value increase by 150k. Per bumper value increases by 1k. Cycle the lit/unlit bumpers whenever the ball is in the upper section. Power overload fuses pop up every 30s. Max 2 fuses at once. Turn 3 modules to side B to trigger a Skill Test. 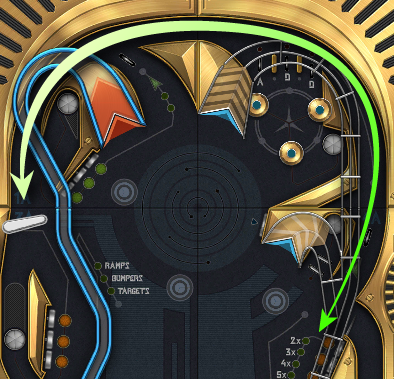 The module that remains on the A side determines the Skill Test you must complete. Each completed Skill Test scores 2.5m + 500k per repeat of that Skill Test. Hit the peg on the module 2B wheel 3x. Ride ramps to reach a count of 7.0. Ramps are worth +1.0, but the count decreases over time – ride fast! Score 2M to complete . Send the ball around the top in both directions. Light all the mini-targets in 2B. Ride each ramp in 1B once. Each Skill Test resets when all Skill Tests are completed. Step 1: turn on the “+ball” lights. 4A: open the 2 stand-up targets blocking the capture hole. Progress is shown on the bottom left side of the table. Step 2: get the ball into the module 4B ramp capture hole. Too much of a good thing will blow some fuses in the table. Automatically 40% of the time at the beginning of a Skill Test. 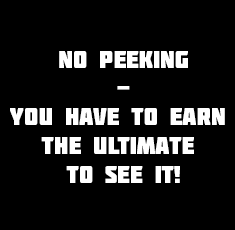 Automatically every 30s in Ultimate.